Typical height and weight varies among the six different dairy cow breeds. No matter the breed, though, the average adult dairy cow typically weighs at least 1,000 pounds. From the black-and-white-spotted heavyweight Holstein to the comparably smaller cream-colored Jersey breed, cow species have distinct appearances of their own. Of the six breeds of cow -- Ayrshire, Brown Swiss, Guernsey, Holstein, Jersey and Milking Shorthorn -- the Holstein and the Brown Swiss are the biggest. The average weight for both of these creatures is 1,500 pounds, which they may reach in as little as two years. A Holstein who may weigh as much as 150 pounds at birth can stand 55 to 58 inches tall by the time she's fully grown. Smaller breeds include the Jersey and the Guernsey, which average 1,000 and 1,100 pounds, respectively. In some cases, the Jersey cow may weigh as little as 800 pounds, but these smaller heifers are not used for dairy as frequently as larger Jersey cows. 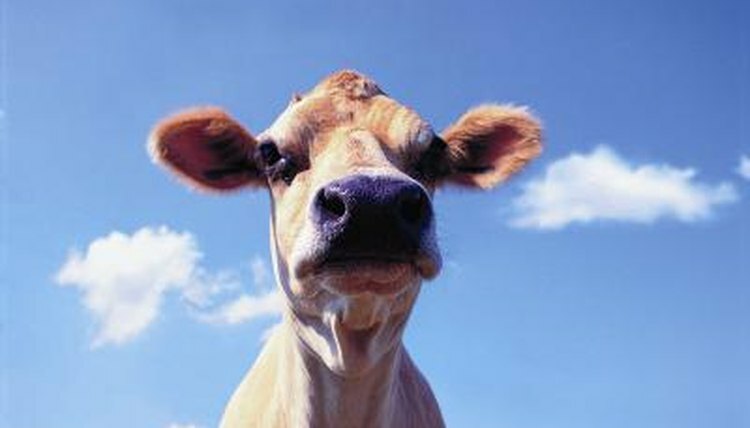 A Jersey cow averages only 48 inches tall.